For the longest time, we didn't eat in our kitchen. We didn't have a table that was appropriate for little ones – we just had a pub height table that only seats 4 and the seats were backless stools. So not appropriate for our 3 little girls. Last year, we bought a gate leg table and bench from Ikea that fit the space. The twins sit on the bench, but the rest of us were relegated to sitting on Costco folding chairs. 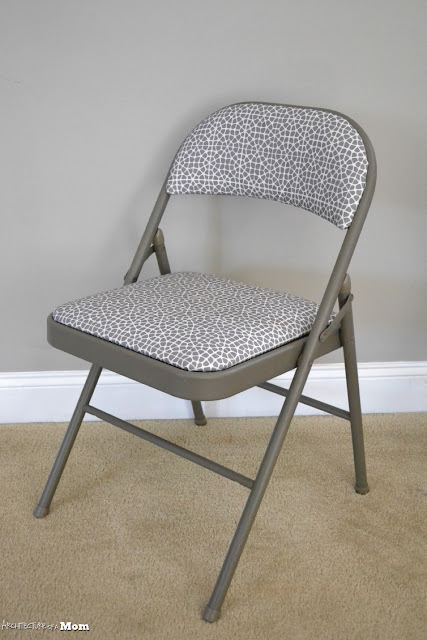 Now, as folding chairs go, these aren't bad – they are comfortable and upholstered. But the fabric...well, the fabric left much to be desired. 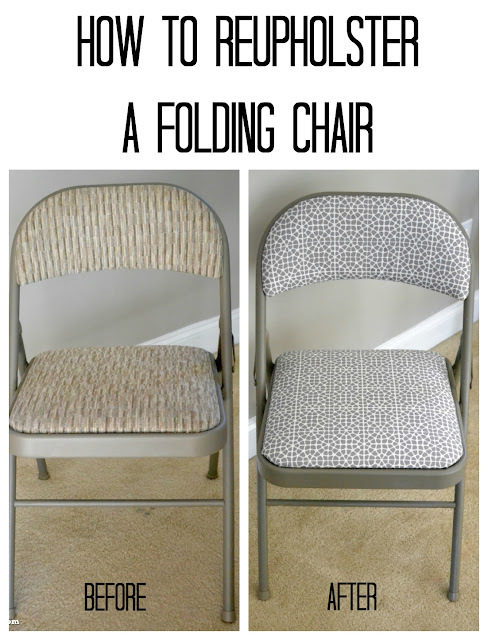 But let me tell you – re-upholstering a folding chair is actually pretty easy! I was asked by Minted to use one of their products in my remodel of my kitchen and living room (so this is a sponsored post – product was given to me – but all opinions and projects are mine!). Have you heard of Minted? Before this project, I thought Minted only did invitations and greeting cards...I was so wrong! Minted is a design marketplace that connects you with independent artists from around the globe...yes, they have stationary, but they also have amazing custom artwork and fabric that is custom printed! I have to admit, I had a really hard time deciding that I did want to re-upholster my chairs because the artwork was amazing! I loved the black and white photos and the gold foil state art! 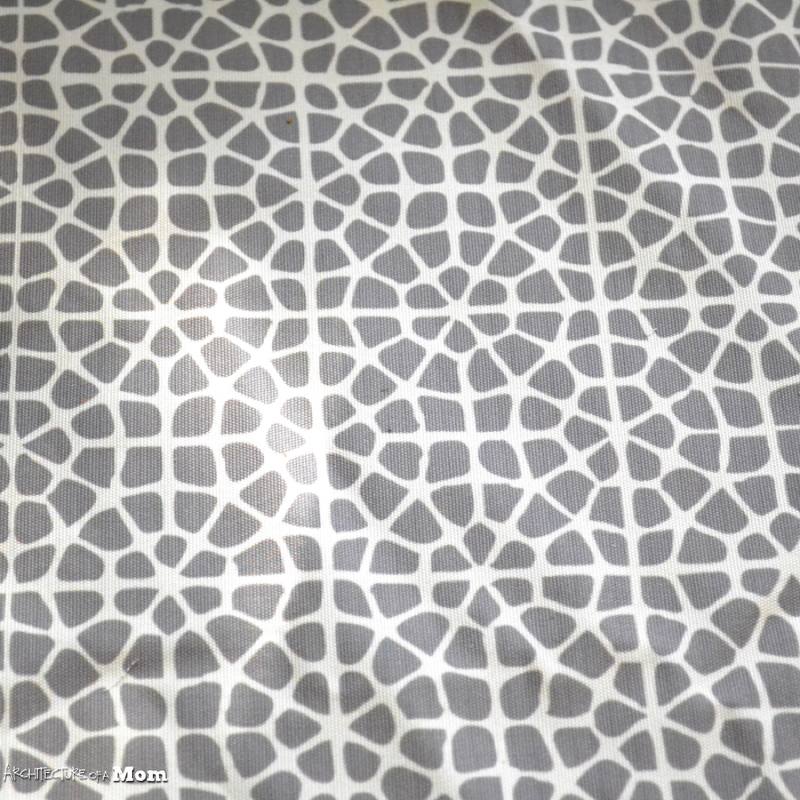 But once I settled on getting fabric, then the really hard part came—deciding on fabric. There are just so many amazing award winning designs. Since I'm going with gray and light aqua in my living room and kitchen update, I settled on those colors in Moroccan Zillij (I also picked up a couple of fun prints for my kids – more on that at a later date). There were so many color ways to choose from in just this pattern. The aqua is too light for kitchen chairs – I'll use that color for pillows in the living room. 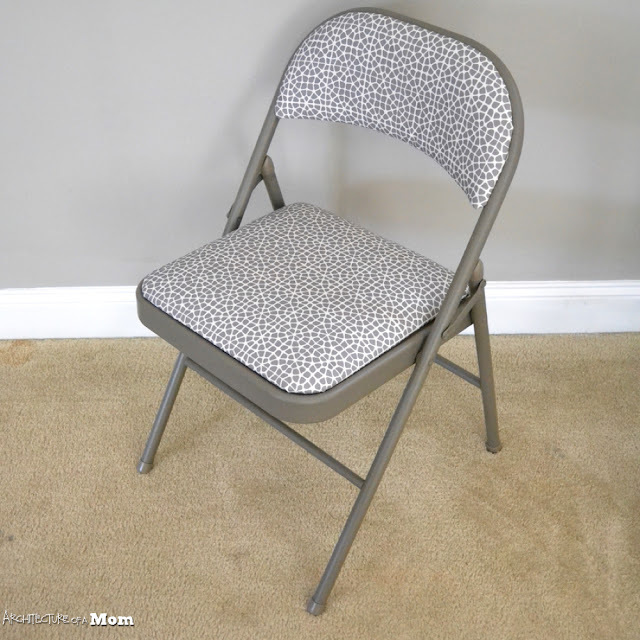 But the gray is perfect for the chairs from Costco—the color goes well with the metal, so I didn't even need to paint them! Upholstery staples in 1/2" and 1/4"
First, take the cushions off the chair. On my chair, the back was easily removed by unscrewing the phillips head screws on the back of the chair. 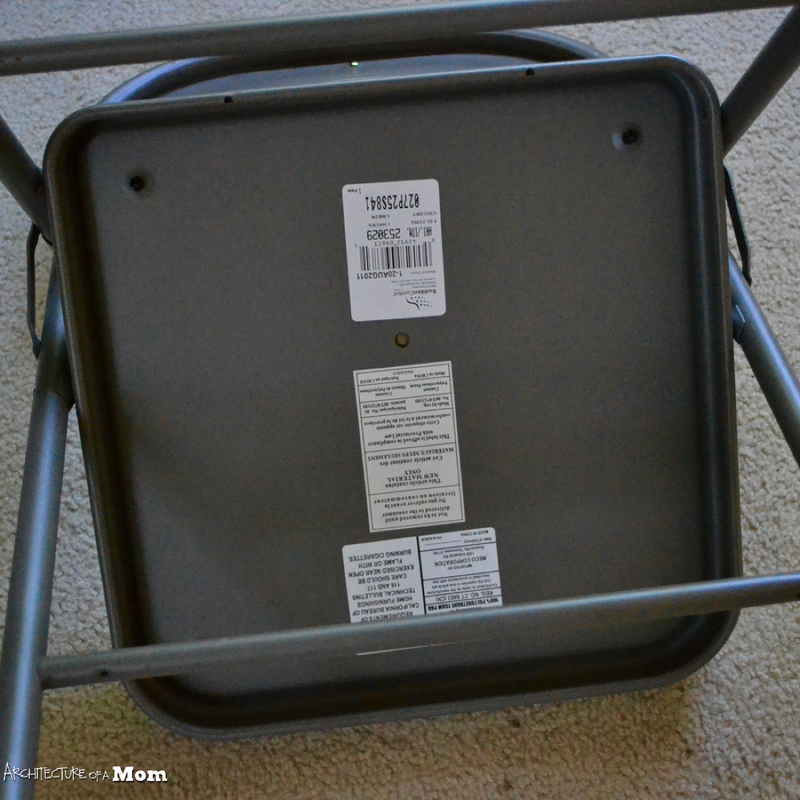 The base, however, was another story—there were plastic screws holding it in place. I used wire cutters to cut off the ends, and then I used a flat head screw driver to push the plastic screws through the seat of the chair. 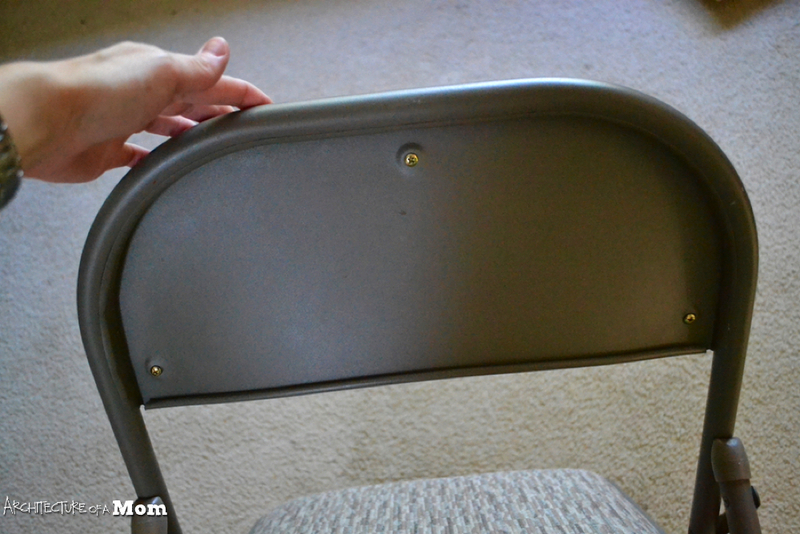 Then, I trimmed the plastic screws again to be as flush as possible to the bottom of the seat cushion. 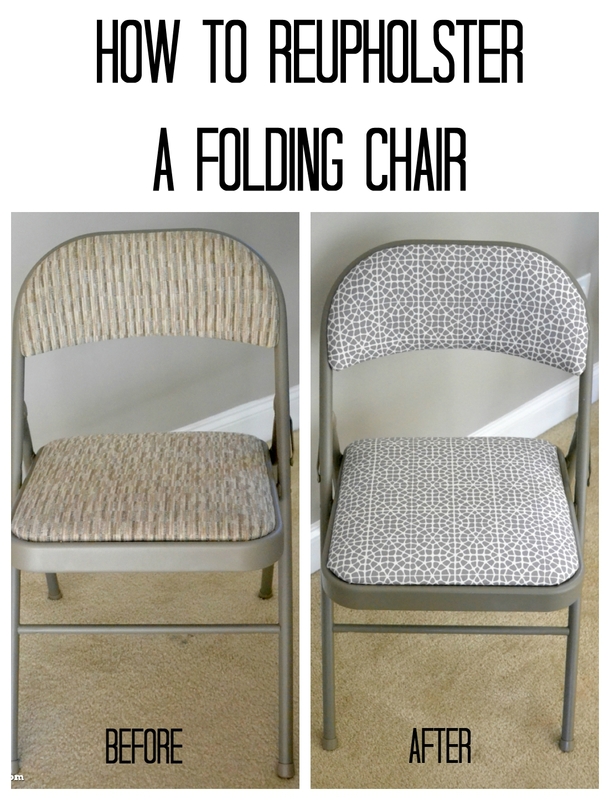 After the cushions are removed from the chair, you're ready to make a pattern. Since I love my fabric, I was a little nervous about winging it and cutting the first piece out of my upholstery fabric. So I took some fabric that I wasn't as enamored with to make a pattern. Basically, I took the pattern fabric and wrapped it around the cushions and as if I was going to upholster with that fabric. I then cut the pattern fabric with wide margins. Then, I trimmed it up to be as close as possible to what I would need. I'm a messy cutter, so this gave me an opportunity to square things up. It may help you to use some tailors chalk and a quilting straight edge—I didn't. Then, take a deep breath and start cutting the real fabric. Some tips: if your fabric has a grid or lines use them. You'll notice if the pattern isn't straight, so align your cushion as much as possible with the grain of the fabric. The old adage "measure twice, cut once" definitely applies to this project. Oh, and always give yourself a little wiggle room—it's easier to trim fabric than add fabric. 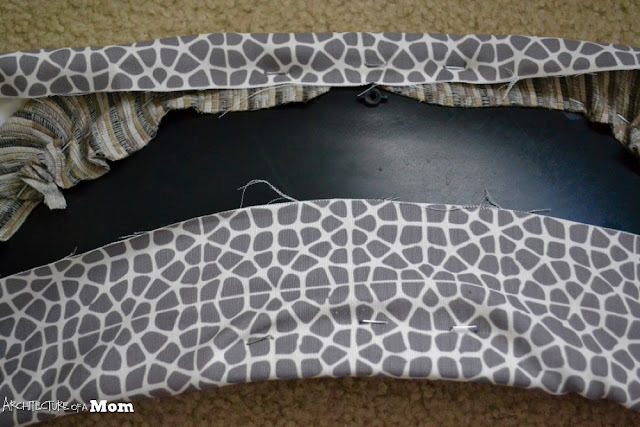 Once you have your fabric cut, use the upholstery stapler to staple the fabric. I just applied my cloth right over the existing upholstery fabric. I used 1/2" staples for the seat and 1/4" staples for the back cushion. I found that the 1/2" staples were too long for the back and the 1/4 staples didn't hold the fabric on the seat. Be sure to center and align the pattern of the cloth to the cushion. Start in the middle of one side, then staple the middle of the other side. Work out from there, alternating sides and checking the alignment of the pattern often. Then staple the other two sides using the same technique. Fold the corners and staple. Trim as required. The back cushion is a little tricky because it's got a concave curve. Start in the middle and work out, alternating between top and bottom—smooth and pull the cloth to keep it from wrinkling. One the cushions have been reupholstered, reattach them to the metal frame. 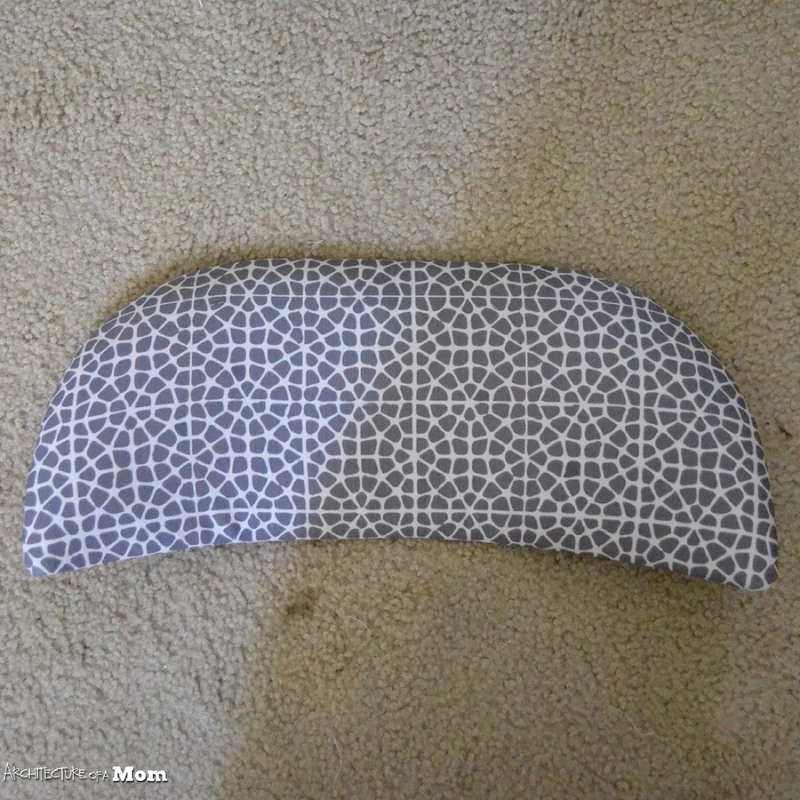 The back cushion is easy; just use the screws that you removed and a screwdriver. The seat must be screwed back on with new screws (since we cut up the plastic ones). I used #10 wood screws in 1/2" length and a drill. With about an afternoon of work, I had a whole new look for my chairs. 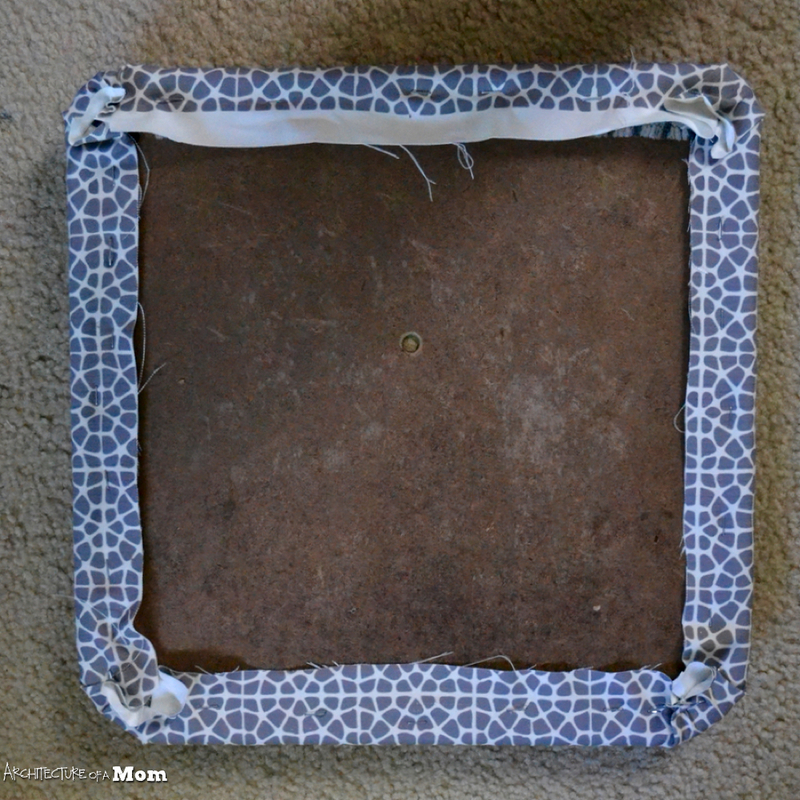 Thanks again Minted, for sponsoring this post!